Wooster Brush recently approached Array to develop a new look for their retail packaging and merchandising. As an industry leader in paint application products, the team at Array was eager to accept the task. With heritage dating back to the 1850’s, the Wooster brand represents quality, durability, innovation and value. The opportunity to work with such a strong brand is an exciting endeavor. Here at Array, the creative process starts with a conversation. We listen and learn from each client to gain an understanding of their needs. In Wooster’s case, consumer research was our first step. Gaining the understanding of how consumers shop for paintbrushes and rollers helped us determine the best direction to take for new packaging. We learned about perception of the brand, what factors influenced shoppers, and how well consumers understood product features. With this knowledge, we began to study nearby categories like paint, sprays and coatings, and even light bulbs and hardware. Learning how competitors use feature callouts and technology claims lends to a greater understanding of current styles in the market. All this research and learning eventually evolves to product positioning, which was the key to the Wooster Brush redesign. How do we position them in stores? The outcome had to present the heritage brand as one that had integrity and presented itself as the highest quality, most durable and professional solution in the category. The primary goal for Array was to develop product positioning that made a meaningful connection with the consumer. In Wooster’s case, these consumers are mainly DIY enthusiasts and professionals. Tasked with not only the design, but also the messaging, Array started off with packaging design for a handful of paint brushes and rollers, then moved on to merchandising concepts and point-of-purchase graphics. After lots of hard work and many late nights, Array presented what we feel is the best solution for Wooster Brush. The new look refreshes the brand and strengthens their position of quality and heritage. The updated packaging stands out from the competition and effectively communicates the brand messaging. Array also developed and executed a color-code system that is easily understood by consumers, making shopability simple and effective. The partnership between Array and Wooster has elevated the brand and strengthened their position as a brand that takes great pride in delivering the highest quality products that are guaranteed to produce professional results. 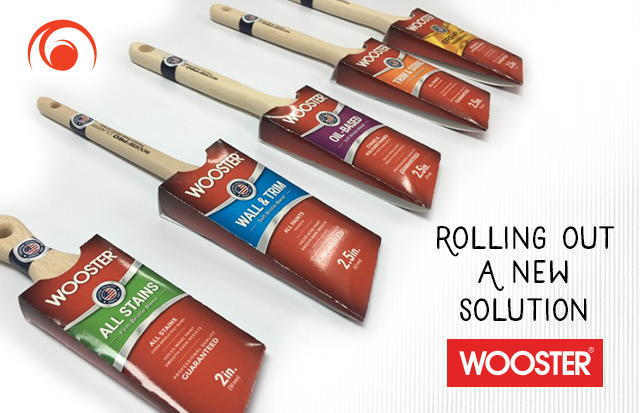 We are excited to see the new packaging exclusively on store shelves at Lowes and for our relationship with the Wooster brand to continue! Check out our other successful rebrands HERE.